Remember when you were a kid and you just couldn’t wait until the last day of school? Every pupil would peel out at record speed as soon as the bell rang on that final day of the school term. Little did we know back then that as adults many of us would do anything to go back to those simple times we enjoyed when we were children. Banking on this mentality is Gakuensai. 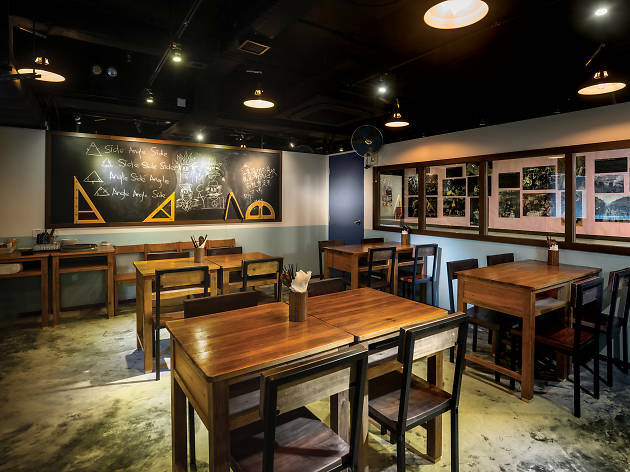 Meaning ‘school open day’ in Japanese, the interiors at this eatery, which has only just opened in TST, are fashioned exactly like part of a high school. Situated in a brand new building on Knutsford Terrace, this place should garner attention from crowds of big-kid diners in the city. As soon as you step out of the lift, you encounter displays of student works and then, to further add to the nostalgic atmosphere, when you turn the next corner, you’re in a student canteen. In fact, at Gakuensai you’re quickly fooled into thinking you’ve walked into some sort of living art exhibition that focuses on school life until you actually see all the adults eating pretty sophisticated food and drinking alcohol in the classrooms. When you head left from the entrance, past the aptly installed ping-pong table, there are two ‘class’ or dining rooms partitioned by pastel-coloured walls. Though there are no major differences between the two areas, the first is a little more intimate, while the second one down the small hallway is brighter and more open. Think history class and then down to the airy science lab. Wooden tables and straightback chairs like those you get in public schools act as dining tables and, like those at school are meant to do until you start rocking on them, they encourage good posture. This unique set-up gives this restaurant bags of energy. Just like that naughty kid who always got sent to detention, you rarely feel like sitting still. 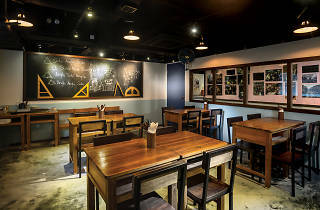 Behind this quirky eatery is Keyaki Group. Bringing authentic – mainly Japanese – dining experiences to our city, this is the prolific group’s seventh venture in less than three years. Starting with Japanese whisky bar Nocturne, which serves the spirit in a fine and sophisticated environment, it must’ve been the success of its latest venture, Ganguya, that has given the team the inspiration to develop the concept for Gakuensai. The Ganguya premises looks like a toy shop at street level and comes complete with figurines and posters dotted throughout the restaurant. Customers have been thrilled by the sheer nostalgia of the surrounds there. This must have encouraged the Keyaki team to conjure up the full-blown back-to-school theme at Gakuensai. The menu at Gakuensai is populated with Japanese and Korean items. 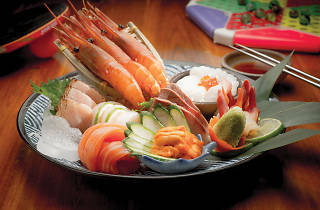 In fact, it prides itself on its fusion Japanese and Korean tapas concept. 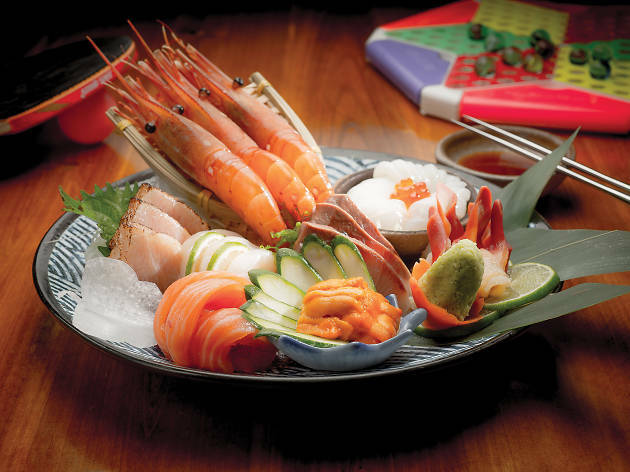 Presented like a school-issue exercise book, complete with ruled lines throughout the menu, the items are categorised into appetisers, sushi, tempura and mains. There are little Korean flag symbols marking dishes that are Hanguk style. 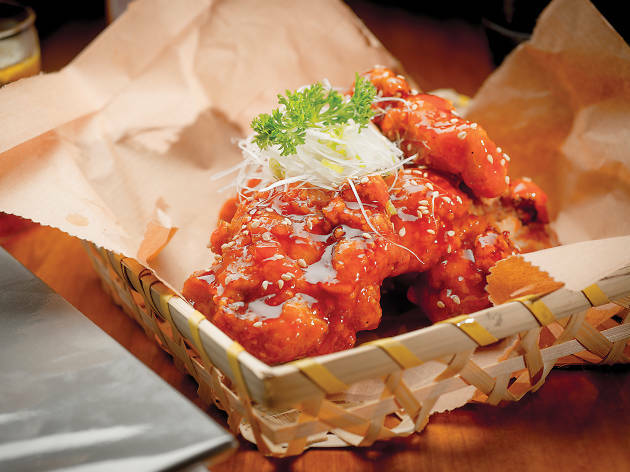 The plates are meant for sharing and, on top of delicious choices like the spicy edamame beans, the cheesy egg rolls, the oyster cutlets and the grilled kurobuta sausages, the pièce de résistance here is the Korean fried chicken. Battered and fried on order only, this item is served scorching hot and crispy – guaranteed. 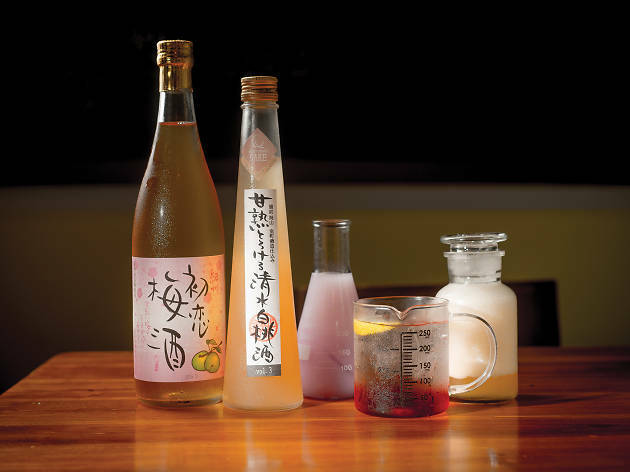 Sake reigns supreme on the drinks list alongside an equally impressive soju collection. There’re also some top draft and bottled beers to guzzle. And, once you’ve had enough to eat and drink, that ping-pong table is actually for customers, so you can play a game or two once you’ve finished your homework. But class isn’t over yet. Guests can also express their creative sides by using the chalkboard in the dining room. Write 100 times: we love the fried chicken. Sushi making is an art form. It goes without saying that the quality of the fish at Gakuensai is top notch, but we love the accompanying rice that’s fragrant, al dente and comes in just the right amount. It leaves you satisfied but with plenty of room to sample more off the menu. The drinks are every bit a part of the experience at Gakuensai. 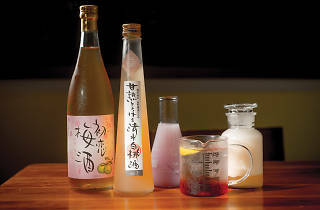 Apart from sake and soju, highlights include Japanese plum and peach wine, as well as cheeky mocktails and cocktails served in chemistry set-like glasses. Order a kyoho grape yoghurt drink or a Tropical Freeze for your less alcoholic-inclined friends. This cracking good chicken deserves all the praise we can give it. There are a few varieties, which include spicy, wasabi mayo, kimchi mayo or au naturel. 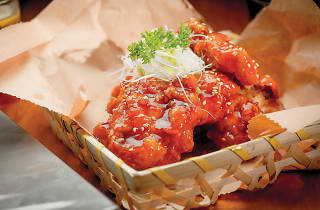 We love the sweet and smooth honey sauce which adds an enticing tang to the crunchiness. Crumbed and basted on order – just be careful not to burn your lips. Warm and inviting, Korean beef brisket stew is the ultimate comfort food and Gakuensai offers up a sweet, tangy and delicious stew that makes you want to order some rice to soak up the sauce. Slow-cooked alongside radishes and carrots, the vegetables absorb the meat juices and are a treat too.